I Can’t Keep Calm, I’m Too Excited! I’m hanging out in Salt Lake City right now because Brooke Graham, one of the hosts of Fox13’s Daily Lifestyle Show, The Place invited me to come to the studio tomorrow morning and talk about The Renegade Seamstress, Refashion Runway and my book, The Refashion Handbook. Kara Muehlmann, from While Camden Sleeps and a contestant on Refashion Runway was a recent guest on the show where she showed how to make an AMAZING beach cover up. (Click here to see how she make it, it’s super cool!) She happened to mention Refashion Runway and it intrigued Brooke enough to find out more about it. Thanks, Kara! You can watch it tomorrow, August 18 at 1:00. This entry was posted in Uncategorized and tagged clothing, DIY, fashion, Fox 13, Refashion, Refashion Runway, Salt Lake City, Sewing, The Place, The Refashion Handbook. Bookmark the permalink. 19 Responses to I Can’t Keep Calm, I’m Too Excited! 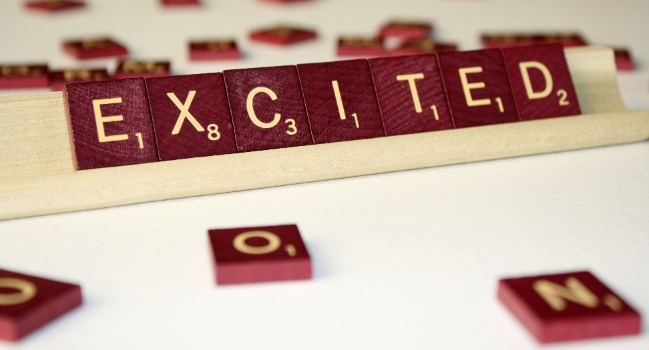 Did you come up with the word -excited- using Scrabble board? You are so clever!! Congratulations! Sounds like loads of fun! Congratulations, Beth! I’ll try to watch it tomorrow. Welcome to Utah! I live about an hour north of Salt Lake. If you are going to be in town for a while we should get together. That’s so exciting. Have fun..I’m sure you will WOW everyone! So proud of you, Beth! Enjoy every minute! That’s amazing! I wish we could see it here in the Midwest! I see you can live stream. Awesome. Can’t wait to see it! So happy for you Beth…..never a dull moment!! So glad and excited-you deserve more recognition. Sadly I don’t see the program on the Portland Fox schedule! But I know you’ll be wonderful. Congrats Beth! That is so amazing!! !